What is Paleoclimatology and Why should we be interested in it? We should be interested in Paleoclimatology because it is important for past, contemporary, and future issues. Understanding past climate helps us to explain how current ecosystems came to be. For example, climate typically controls what types of vegetation grow in a particular area. Furthermore, paleoclimatology provides data that we can use to model and predict both current and future climate change scenarios. Computer models can be used to study the potential effect of increased atmospheric carbon dioxide on climate. The earth is approximately 4.6 billion years old. The image below illustrates the geological time scale which consists of Eons, Eras, Periods and Epochs. This video provides a good overview of the geological time scale. The graph in this link provides an overview of how the climate, in terms of “Average Global Temperature” (AGT), has changed starting from around the beginning of the Cenozoic era. How Do We Take Ancient Temperatures? Temperature variations as well as concentrations of GHGs in the deep past are studied based primarily on analysis of ice cores—another type of proxy data. These ice cores not only record atmospheric temperatures through time, they also contain frozen bubbles that provide us with tiny samples of ancient air. Our longest ice core extends more than 800,000 years into the past. Ice Cores are archived at the National Ice Core Lab funded by the National Science Foundation. Ice Cores. ice has accumulated from snowfall over many millennia. Scientists drill through the deep ice to collect ice cores, which often have distinct layers in them. Ward discusses the prior greenhouse gas extinctions in Earth’s long history and explains how they are analogous to what we are facing today. Generally, Ward says “when CO2 goes up, temperatures go up.” Historically, it is known that massive increases in CO2 emissions from volcanoes in the past have shifted the climate causing global mass extinctions. They also spewed ash, steam, and other gases and solids that impact climate as well. These waves of volcanism played a significant part in most of the 5 prior mass extinctions by significantly raising greenhouse gas (GHG) concentrations in the atmosphere. This along with other factors like solar activity and the modulation of the orbital parameters of the Earth are just some of the puzzle pieces that make up the big picture of ancient climate change. “Atmospheric CO2 levels have reached spectacular values in the deep past, possibly topping over 5000 ppm in the late Ordovician around 440 million years ago. However, solar activity also falls as you go further back. In the early Phanerozoic, solar output was about 4% less than current levels. The combined net effect from CO2 and solar variations are shown in Figure 2. Periods of geographically widespread ice are indicated by shaded areas…. The fast and slow carbon cycles maintain a relatively steady concentration of carbon in the atmosphere, land, plants, and ocean. But when anything changes the amount of carbon in one repository, the effect ripples through the others. In Earth’s deep past, the carbon cycle has changed in response to climate change many times. As we have discussed, changes in Earth’s orbit alter the amount of energy Earth receives from the Sun and leads to a cycle of ice ages and warm periods like Earth’s current climate. Ice ages developed when Northern Hemisphere summers cooled and ice built up on land, which in turn slowed the carbon cycle. Meanwhile, a number of factors including cooler temperatures and increased phytoplankton growth may have increased the amount of carbon the ocean took out of the atmosphere. The drop in atmospheric carbon caused additional cooling. Similarly, at the end of the last Ice Age, 10,000 years ago, carbon dioxide in the atmosphere rose dramatically as temperatures warmed giving us the climate we have today. Shifts in Earth’s climate due to orbital fluctuations are happening constantly, in predictable cycles. In the deep past these shifts caused the great ice ages. Today, changes in the carbon cycle are happening because of people. We are disrupting the carbon cycle by burning fossil fuels and clearing land. We were expecting the next ice age in the next 50,000 years due to this cycle. However, H.J. Schellenhuber calculates, using geophysics exponential equations he calls simple, that we have even thrown off the next ice age. Even though it has become very popular for deniers to argue that the Earth is cooling and there is another ice age coming, this is not what objective, credible research tell us. This foundational paleoclimatology provides a clear picture of the causes of prior mass extinctions. The PETM is said to have been caused by a sudden spike in CO2, though what caused it is still under debate. It was thought to have come from the thawing of methane clathrates in deep ocean sediments, but the latest theory is that it was caused by a massive volcanic eruption that heated up coal deposits. The PETM event resulted in one of the largest known extinctions of life forms in the deep ocean. Atmospheric temperatures increased by 5-8°C within a couple thousand years. The seas were a hot 23°C. The warming, which lasted 200,000 years, was caused by the release of massive amounts of methane or CO2. In other words, the PETM is an example of catastrophic global warming triggered by the build-up of greenhouse gases in the atmosphere. The amount of carbon added to the atmosphere during this event varies between 2,000-10,000 billion tonnes of carbon according to reconstructions of this data. Although climate archives become less certain the further back we go, it is estimated that the carbon release must have been below 1.1 billion tons of carbon per year. That is quantified as about one-tenth of the rate of today’s carbon emissions from human activities such as burning fossil fuels; a cautionary tale if ever there was one. Climate variability over the past 12,000 years has been caused by changes in external climate drivers, or internally generated by nonlinear dynamics and interactions among the different components of the climate system. The climate of the Holocene really has been very stable, with temperatures only varying by a few degrees. The Holocene cold and warm periods, represent only small temperature changes compared to the glaciations and even to other interglacial periods. By contrast, the climate in the previous ice age was not nearly as stable and the temperature often varied more than 20°C during a few hundred years. During the deglaciation that began later in the Holocene, the main external climate drivers were again the modulation of the orbital parameters of the Earth, change in the solar irradiance, volcanic activity, the concentration of GHGs in the atmosphere, astronomical conditions, thermal insulation. and changes in the properties of land cover – a bit of an unknown which is not widely discussed. Finally, What Causes Climate Change? What is clear from the study of past climate is that many factors influence climate. There are many more factors than listed here as this is only the tip of the iceberg, as it were. This resource is meant as an introduction to some of these complexities. In addition, the details are seldom as simple as they seem at first glance. There are complex interactions between many of these factors that can amplify or dampen changes in temperature. Further study is always encouraged. There are many complexities in the paleoclimate record that are often overlooked and/or relatively unknown. In this discussion we have listed several of them. It is worth noting that according to Tom Yulsman at Discover Magazine “researchers also never contended that CO2 is the sole factor driving climate changes over geologic history. As we’ve seen, however, it plays a key role: Without the CO2 thermostat, Earth would likely be a proverbial snowball.” We tend to focus on CO2 but the picture is actually much more complex. There are also differences in C12/C13 ratio impacts. This is not nearly as straightforward as it may ostensibly seem and journalists, large corporations and politicians speaking on these matters are usually not in the know on these matters like scientists. In short, the fact that it has been warmer in the past does not mean that future warming is nothing to worry about. The sea level has been tens of meters higher during past warm periods in our deep history, enough to submerge most major cities around the world. Temperatures were much higher than our current perfect 14°C world. There were no humans on the planet during these times. It was quite literally a different world. This graph shows a steep increase in CO2 and temperatures going quite literally off the charts. This is unprecedented. Therefore, even though the paleoclimate record has provided us with many key insights, we are reminded that in this case our knowledge of the past may be insufficient to fully comprehend the anthropogenic factors we are adding to this complex system in ways never seen before in the history of the planet. We are in uncharted territory. Understanding this deep history has clearly aided in establishing evidence for the causal relationship between CO2 and AGT (average global temperatures) even though 30+ years later deniers still lie about these facts as well as the simple physics behind these models. In modern times, we cannot forget that there is a 97% scientific consensus on this causal relationship as more recent decades have provided us with indisputable evidence. We have recently entered the sixth mass extinction. In this case, human industrial activity especially the burning of fossil fuels, has become comparable to the volcanism of our distant past. 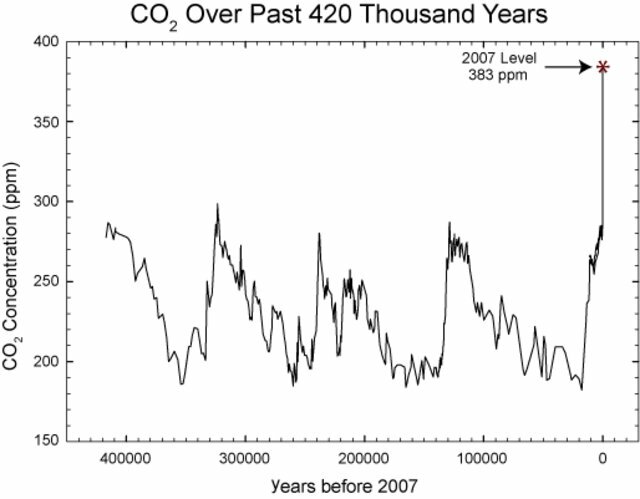 Recent data indicates that we are now at 409+ ppm CO2. This figure has shot up very quickly in terms of geological time scales. In fact, it is unprecedented even in the oldest paleontology records. Further, Peter Ward states “we already have 3 feet of sea level rise baked in” given our current emissions trajectory. CO2 concentrations take decades to reduce. Additionally, H.J. Schellenhuber says in the video provided above that we have even thrown off the entire Quaternary procession. The Arctic ocean is in a death spiral toward the first blue ocean event, and Greenland is right behind it. We have already passed 4 of the 9 planetary boundaries. Additionally, the 3 feet of sea level rise researchers are now expecting due to anthropogenic climate forcings in the modern era will displace millions of people in coastal cities around the world. The evidence now conclusively shows us that large planetary boundary disruptions are already in place due to human activity. This means that even if we stop fossil fuel emissions today, we are already too late to stop the seas rising unpredictably into the next decades from 3 to as much as 6 feet according to some estimates. Thus, we are already literally in over our heads with the climate changes predicted in many places around the globe as global warming repeats itself (video) as it has many times before in history. However, according to eminent climate scientist and paleoclimatologist Michael Mann “‘we can still prevent many of the worst impacts of climate change from playing out.” In this video Michael Mann looks Into our climate past to interpret our climate future. 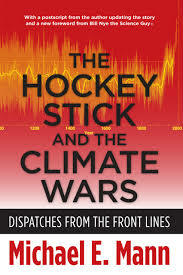 Michael Mann’s Hockey Stick Model presents climate data for the last millennium. The methods used in reconstructions of the temperature record of the past 1000 years have been disputed. However, reconstructions have consistently shown that the rise in the instrumental temperature record of the past 150 years is not matched in earlier centuries, and the name “hockey stick graph” was coined for figures showing a long-term decline followed by an abrupt rise in temperatures. This is a nothing short of an invisible crisis; one we often ignore because it is not visible to us over such vast time scales. In short, It’s clear that we simply cannot continue with business as usual (BAU) and even though the picture is bleak, we must take care to prompt action, not paralysis. “There’s still time to make the right choices” says Michael Mann (video). 4:00 pm Feb.4, 2019 – Shani Cairns – (Added some notes on how not just CO2 impacts climate change and some basics on C12/C13 ratios). 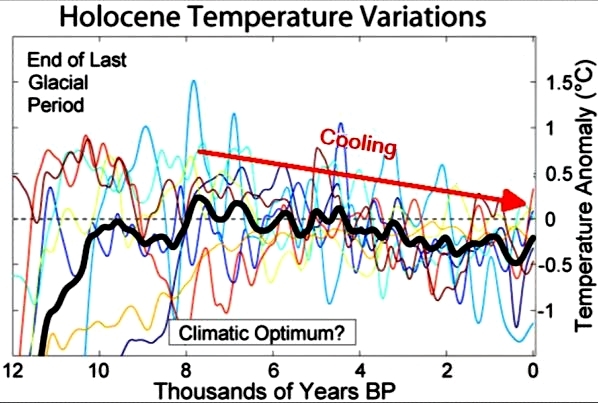 7:00 pm Feb. 2, 2019 – Shani Cairns – (Added several charts showing CO2 and temperature correlations in the deep past and updated explanations of paleoclimate record changes regarding solar activity, Milankovitch Cycles, volcanism and so forth. Also added section discussing Holocene warm periods). 4:00 pm Feb. 2, 2019 – Charles Gregoire – (Fixed a few typos and the link for the 97% consensus statement). 6:00 pm Jan. 30, 2019 – Shani Cairns – (Added section content and write up of A Paleoclimatology Perspective on Climate Change and introduced Peter Ward, H.J. Shellnhuber, and Michael Mann and some other paleoclimatology experts on climate change). 1:00 pm Jan. 29, 2019 – Charles Gregoire – (Set up initial draft page). Note: This page as with many wiki pages is a work in progress. It aims to inform the reader of the topic of Paleoclimatology.